While Lana and I were loitering around hospital with Martin, we spent time with other patients and their parents in the children's ward. One such lad who was recovering from a tonsillectomy was enjoyable company. 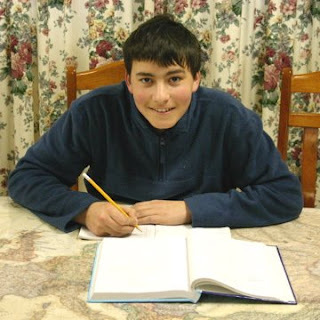 His mother wanted to make sure he didn't miss any of his schooling so had arranged to pick up his school books and find out to what page he was required to finish. She was told that the rest of the class was up to page 34 of the Maths book. The schools have just returned for Term 3 (out of 4) so we would have thought the class would be about half way through the book. But the book has around 180 pages! "Oh, we never finish the books," answered the lad, as if this was common knowledge. Thinking back to our school days I remember we never finished our text books either. No wonder the first 25% to 33% of each year's books review the prior year. This is probably because the students didn't actually cover the topics being "reviewed"! Meanwhile, most homeschool parents stress over completing each of the school books. We get the book, look at the total number of lessons or pages, divide by the number of school weeks and then proceed to do that much per week. As the end of the year draws near, the children see the book is nearing completion and wonder things like, "Hey, there are only 4 lessons to go. I'll just do them now and I can put the book away!" We explained this to the boy's mother and she agreed it all made sense to her. Also, one of the boy's assignments was to write an essay on "How do you feel about ANZAC day?" "What's ANZAC day?" he asked. In Australia this is a sad indictment of the school and the parents. It is comparable to a US student asking, "What's Memorial Day?" Why would the school give an assignment about a subject if it hasn't even been discussed or taught at school first? And even then, what type of stupid assignment asks how you "feel" about the topic? How can you be marked wrong? So we once more find additional reasons to homeschool. Is this a good date? We have escaped the hospital. Martin will have to go back on Friday for a checkup but all should be well. The abscess was about the size of a marble and very painful, but the hole is already starting to heal and Martin is much happier. Whenever any of the nursing staff or doctors approached Martin he gave them a very severe look. When he was placed on the bed so they could inspect his progress he started wailing strongly. Even getting his temperature taken was deemed too intrusive for Martin. However, he calmed down quickly and after Lana had taken his temperature, happily wandered to the Nursing station and gave them back the thermometer. Last Saturday I meant to take Lana on a "date" but it didn't really work out and we just had time together and did a little shopping. Upon our return home Ariel was disgusted and said to us, "Shopping isn't a date." Ariel claims Mum was also disappointed, so with two women against me I had no hope. I had to try again. So on Saturday we tried again and this time caught a movie and had a meal together, although Martin was a bit whiny at the time and accompanied us. This was better and had a higher "Ariel Approval Rating". Yesterday when Lana was sitting in her chair, exhausted from a weary night's sleep in her clothes on an uncomfortable pull out bed, holding a tired and sore Martin, I asked, "Is this a good date?" I was rewarded with a weak smile. Well, this is what family life is all about. We make our various plans and then life intervenes. Then plans are changed and we all cope with the new circumstances. If it wasn't for these trials, then the good parts would all blend together. It's like seasons. Winter makes us appreciate Summer, and the heights of Summer make us long for Winter. The good times can lull us into a false sense of security and allow us to assume that life should always be like this. It's events like these that remind us how truly fortunate we are. Yesterday Martin was not happy. When we changed his nappy we noticed a really big sore. Lana called me and we decided Lana should take Martin to the doctor. At 4:00pm Lana was brought in to the assistant doctor. She took one look and called in the main doctor. 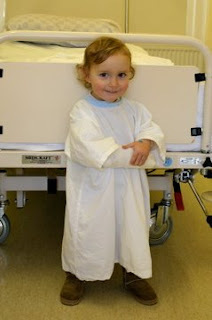 Lana was sent to the hospital to check with the pediatrician and surgeon. I left Sydney and met Lana at 5:30 pm and we waited around while various staff did their thing by walking in, asking the same questions, having a look and then walking out with very little information passed to us. I don't know why the interpersonal skills of hospital staff are so lacking. A simple, "Hello, my name is X and this is what's happening" would be great. Instead we had the "hurry up and wait" syndrome until 8:00pm when we discovered Martin would be staying at the hospital overnight ready for an operation first thing in the morning. Gee, thanks for letting us know this was happening guys! Anyway, now the operation is over, we have finally been told that Martin had a perianal abscess. We did know that the abscess or tumor would have to be drained, but that is all we knew beforehand. This is often caused by bacteria getting into a small cut or scratch near the bottom exit area and then having a party causing an abscess. So now Martin will be in hospital for the next day or so, having antibiotics to attack the infection and recover from the operation and anesthesia. The hardest part was applying the cannula. As you can see by the photo it is well attached to stop Martin getting at it. He was wrapped in a sheet so only one arm was free. 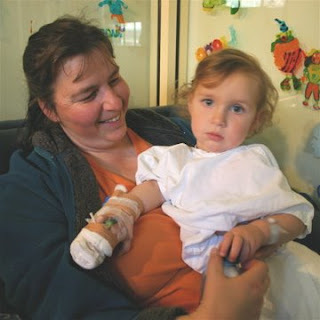 Lana hugged him tightly, one nurse held his upper arm and another held his lower arm. The pediatrician then inserted the cannula and applied the bandages. At times Martin was winning the struggle! Now that we are home and have had a really good sleep, we are taking time to reflect on yesterday. We are very glad we took the trouble to be part of World Youth Day. The next WYD has been announced for 2011 in Madrid, Spain. Ariel will be 20 and Eric 17 so I think we will try to be there with me as a chaperone. We saw that attending a WYD can be a good or bad experience depending on the group with which you attend. 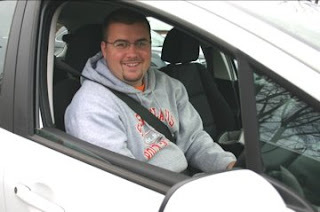 A good group with solid priests and chaperones can increase the good sides for all attending. The pilgrims that stayed with us had the mix pretty good. The unaccompanied pilgrims we saw at WYD showed the other options. So we are calling one of the good priests we know who will most likely be going and arrange to be part of his group. Even if he doesn't know it yet. We have 3 years to save the money and learn Spanish. 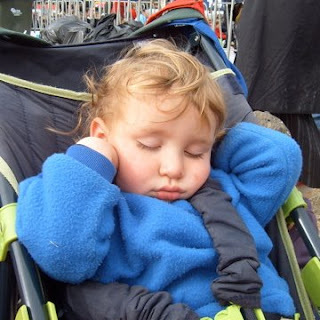 The first photo is of Martin during the Pope's homily. The location of his hands certainly caused a few smiles. 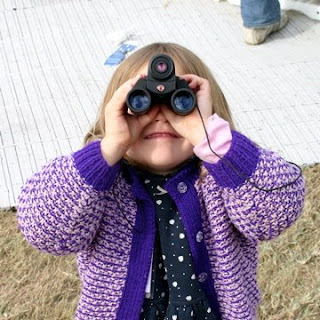 Rose also enjoyed herself using Eric's binoculars. The children did really well with all the walking. We had to carry Martin often, and occasionally put Rose on my shoulders, but overall they walked all the way. Clare did the whole walk with hardly any complaining. Meanwhile, the less fit of us (Lana, Ariel, James and myself) all have blisters on our feet and sore hips. We are going to start regular walks to improve our fitness. If we intend on more travelling we need to be able to do so with less soreness! As Rose had plenty of time on my shoulders or in the stroller, she decided it was time to skip as we approached the train station on the way home. "You wouldn't skip when my feet didn't hurt, and I'm not doing it now!" There were flags everywhere! Every nationality had their flag flying proudly and provided all geography students with an impromptu quiz. One flag I couldn't recognise which was flying in many places was a yellow one with three red horizontal stripes. I asked one of the pilgrims holding this flag and he informed me it was the Vietnamese flag - from before the communists took over. This flag was flown by thousands of the Vietnamese refugees and their descendants. The fellow I spoke to has been in Australia over 25 years and happily explained it all to me. 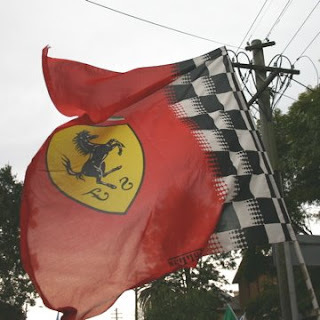 This last photo is of the flag of Ferrari - the motor vehicle company. I asked loudly, "I didn't realise Ferrari was a country. I wonder what cars they drive there?" and the fellow holding the flag laughed and waved his flag more vigorously. Luckily, the client I was meant to visit today was the one who had the great view at the altar yesterday. He was very accommodating and allowed me to cancel the appointment so I could let my feet and legs recover. He has had a great laugh at how much fitter he is being over 25 years older than me! We are glad we went, but will be even more glad when our unfit bodies recover. 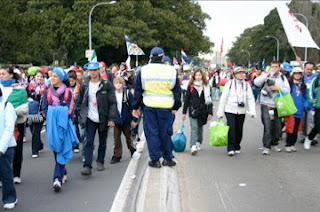 We hope you have enjoyed our coverage of World Youth Day. 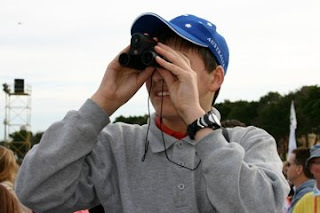 We may get some more photos if "our" pilgrims send some to us, and we might then add a few more straggling posts, but we are glad to have been able to provide a glimpse of WYD 2008 from a local family's point of view. The key to not getting lost or losing members of the group it have some easily identifiable clothing. 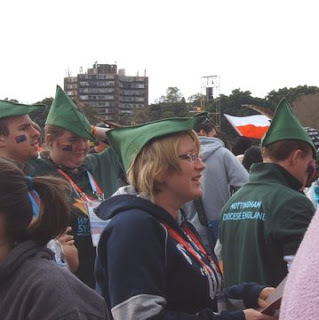 These pilgrims from Nottingham Diocese in England had their Robin Hood hats. 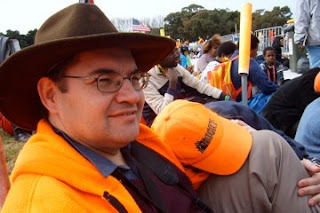 We had the orange jackets and caps. One policeman saw the boys' caps and commented, "You won't get lost with those hats!" Escaping from Randwick was a very slow affair. 500,000 people all were trying to go the same way at the same time makes for crowded conditions. It was a matter of following the crowd and stopping often. At one stop Rose REALLY had to go. But we were in a fenced off part with no exits. We looked at a policewoman and asked, "Is there anywhere she can go to the toilet?" She looked apologetic and said "We have been holding on too!" One of the policemen overheard and stepped up, noticing Rose holding on to her bottom and jiggling. "If you're really desperate, you can go over there behind the tent for discreteness." "Yes please!" Lana answered and the policemen let Lana and Rose out a gap in the fence. Phew, disaster averted. When Lana went to get back in and asked to get trough the fence, the policemen was joking around, "No, No! Don't let them back in!" "That's Ok", Lana replied, "There's less people this side." Smiling, they let Lana return to our side of the fence. The police were really good. Lana asked how the crowd had been behaving and a policewoman said the crowd was really good, no troubles. Unlike soccer or football crowds. One of the volunteers told us they had often asked the police if any of the pilgrims had caused trouble and the consistent reply was "No trouble at all." They added that normal crime was also less than usual. This policeman was standing on the median strip. He noticed Rose and Clare approaching him as the children concentrated on balancing on the median strip - as children do. He motioned to his fellow policeman and both stepped off to let Clare and Rose pass, then both stepped back up. We were walking along a more open strip of road with parks on either side which had toilets! We had a quick stop for all those that had to do their duty. James took the opportunity to rest. Rather than join the large crowds and try to get on the trains now, we had a meal at the Oz-Turk restaurant in George Street, Sydney. This is a 24 hour eating place with inexpensive, tasty food. I went here often when I was working a lot in the city. We had an enjoyable meal, off our feet, and were able to allow the crowds to gradually diminish. While we were seated we noticed a pilgrim approach the counter and say, "I had a meal here yesterday, but I missed out on paying. I had the $10 meal." It was worth being there to note the surprise on the employee's face as he accepted the money and said a dazed "Thanks". We got back on our feet with a few groans, reached the station and once more the train was there as we were and we departed on time. "Hurry, Lana. The train is here!" Lana's look was priceless as she struggled up those stairs carrying Martin. One of my clients was also at the Mass. He called me on my mobile as he figured that we would be there too. He said that he and his wife went for a wander to have a closer look at the altar, but when they turned back the way was blocked so he ended up with a great view of the whole thing! In this first photo you can see how well we fit in with the Papua New Guinea pilgrims. Ariel has her head resting on me as she had a version of what Martin had and wasn't feeling the best. But she soldiered on, offering it up. We met one of the ladies from our parish who was a volunteer providing information to all and sundry. She told us that "our" pilgrims were in section E1 - WAY over the other side of the venue. We figured the best time would be when everyone else was on the move at communion time. Meanwhile we were able to enjoy the Mass with fine readings, music and ceremony. We could see the screens well enough and so were able to tell what was happening. Those around us also participated in the Mass and it was a great feeling knowing you are part of a Mass with so many hundreds of thousands of other people. The Holy Father's sermon was in English, naturally enough, and he spoke it with only a little accent, and we were all able to follow along easily. After the Homily, there was time for reflection and then the people being confirmed were announced and we all joined in sharing their baptismal promises. "Do you reject Satan and all of his empty promises?" "I do" the huge crowd responded. These responses were made all the more impressive as they echoed around the huge venue. Meanwhile Martin also enjoyed himself. We were next to the sandy part of the racetrack, so Martin figured this would make a great sandpit. Some of the Papua New Guinean girls were all smiles watching him play with the sand, throwing it all over himself. After the consecration it was time for communion. We quickly started off and across the venue via the criss crossing pathways trying to get near E1 and also receive communion. Unfortunately, the paths were changed from the map we had seen. Also, there were so many people receiving communion that all pathways were blocked. All priests with communion were accompanied by a "minder" carrying a large yellow umbrella to help everyone find a place for receiving communion. At one point we were stopped next to a space left free for emergency traffic, some of our nearby pilgrims saw a priest and started calling over to him. He noticed us and they came into the empty area and began distributing communion using the barrier fence like an Altar Rail. The altar rail method was much more efficient. Those at the front received communion and then made their way back allowing those behind to move forward. This changing of places all happened while the priest continued distributing communion along the line. Then other priests were noticed and called to, and we ended up with three priests distributing communion. We then moved further towards the mythical E1, but the pathways had changed and the way was blocked by this crowd of people. Ah well. We stayed where we were hoping "our" pilgrims would stay around a little after Mass gathering their gear. Once Mass was over the exodus began. One American we spoke to said it was like "all the crowds caused by Hurricane Katrina - but nobody got killed". We finally arrived at E1 but it was empty of people we knew. 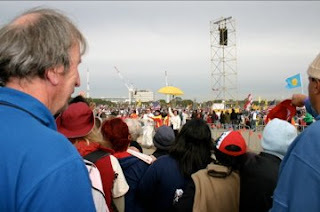 Later on we discovered they had also ignored their official places and were able to get right up the front, within a very short distance of the Pope and the Altar. We can't blame them for that! We awoke at 4:15am, dressed ourselves and packed the van. 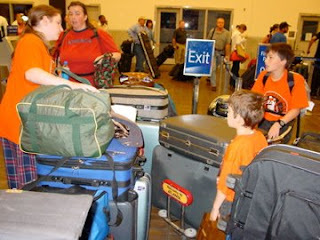 All of the bags were packed the night before so we actually departed on time at 4:45am! We arrived at the train station on time and joined the ticket machine queue. This would have had to have been the first time there was a queue at the ticket machine before 6am on a Sunday morning. Sydney Rail has a special family pricing where you pay for all adults (16 and over) and one child and the rest of the children travel free. The train left just as we arrived and we arrived at Sydney Central station right on time. Then our pilgrimmage really began. It is said that a pilgrimmage is supposed to include hardships we are to offer up for others. Our hardship was the long walking, big crowds and very long day. This first photo show the helpful signs posted along the route. There was no way to get confused or make wrong turns. The complete route was fenced with all pilgrims funnelled straight to Randwick Park. 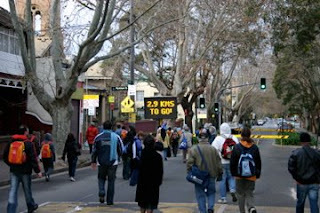 The distance was about 6 km which is a long way for unfit people like us. But plod on we did. Many of the "official" pilgrims arrived there the night before and slept at the grounds. Randwick is a horse racetrack and has a capacity of around 300,000. 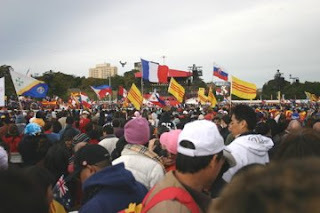 The estimated number of people attending the final Mass at either Randwick or nearby Centennial Park was about 500,000 people! If you see any photos of the crowd we are a couple of orange dots. Once we entered through the gate and found our designated area, the overnight sleepers had obviously forgotten what they were there for. 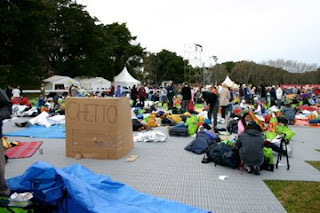 These pilgrims were obviously without any group leaders or adult supervisors and so left their rubbish everywhere and stayed in their sleeping bags even when the Pope went past, thousands of people stepped over them and Mass was starting. Lana noticed people with tickets from other areas in our area and figured we could do better than stay here. Eric was able to point out some other spots using his binoculars and you needed binoculars just to see the main altar or some of the big video screens. So we went wandering, pretending to find "our" group. This plan worked very well. We ended up finding a much better location near a Papua New Guinea group and we fit right in. We are getting ready for tomorrow's rather big day out when we attend the World Youth Day Mass. 1. Get the tickets - availability and opportunity we left in God's hands. We picked them up from the homestay co-ordinator yesterday. Check. 2. Transport - there was no room on the parish bus. But we have our own 12 seater family car (Ford Transit Van). We will travel from here to an outlying suburb to catch the train that is part of the Sydney Metropolitan system. The train system has put on lots of extra trains. There seem like more trains than a normal weekday, let alone a Sunday. So we leave really early, get to the station quite early and arrive in Sydney around 2 hours before the starting time, giving us lots of leeway and walking time to the venue. So, Check! 3. 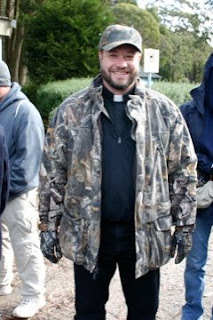 Appropriate clothing - see the photo for our "travel in large crowds" gear. 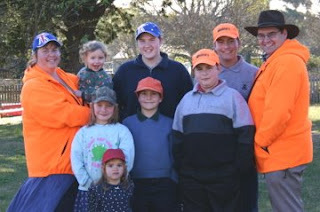 Lana and I are wearing our hunting jackets we bought in the US and the boys have the bright orange hunting caps. The weather is predicted to be really nice, so we will be wearing layers. Check. 4. Group plans - each child has a travel partner so they stay together. Also, we have pinned on a little card to each child's clothes with their name and the mobile phone numbers for Lana and me. Now that we are prepared nothing will go wrong in that area. Children have been reminded that if they lose sight of us, they must stop. If someone asks if they are lost, the child is to show them their card. All rehearsed. Check. 5. Food and drink - Lana is making some sultana cake, sandwiches, dried fruit and plenty of water. We have two backpacks to carry the Martin supplies and the food and drink while keeping our hands free. Check. 6. Martin - Nappies, lots of wipes, drink containers and very portable stroller. 7. Boredom on long train ride - We have packed two books with short stories - Bobby Brewster and Little Pete. I'll read to them which should work. Check. 8. Camera and Video - charge the batteries, carry spare for the camera. Check. So, I think we are ready. An early night and then we leave in the wee hours of the morning. We'll report back tomorrow! Are WYD pilgrims winning the heart of Sydney? Sydney's Daily Telegraph is reporting that strange things are happening in Sydney. Joy is breaking out despite all of Sydney's best efforts. It seems as though over 150,000 joyful Catholic pilgrims can make a difference to the normal hustle, bustle, gloom of typical Sydney folk. Romeo Mike has a good post with some sample video of Sydney's streets. And to shock even the most seasoned locals, the Sydney Morning Herald has some positive coverage with great quotes from pilgrims. 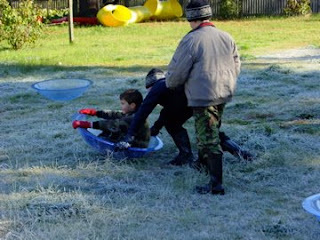 "We stayed last night at a Pymble school classroom and we froze, and I think it will be the same again tonight. "But if Jesus carried the cross we can carry our luggage." And tomorrow, we'll be in the midst of it all! We have received a bonus after hosting the pilgrims earlier this week. We have been given the opportunity for tickets to the final WYD Mass on Sunday. We accepted and started planning. Then Martin came down with a rash, fever, teething and being generally miserable. Yesterday he showed spots on his belly and back. Oh No! The symptoms matched either Chicken Pox or German Measles! That wouldn't do for a huge public gathering like the WYD mass. So today we went to the doctor. He was a fellow parishioner and had also hosted some pilgrims. His experiences matched ours. Anyway he was very experienced and old enough to have seen measles and german measles. He said the spots were not the right size and colour and it looks as though Martin is almost through whatever viral thing he has. So we are cleared for Mass! We then chatted for about 10 minutes on our mutual enjoyable experiences with our pilgrims. Here is Martin resting. 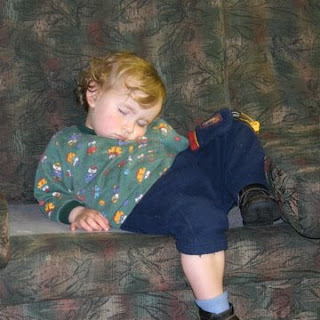 Somehow babies are able to sleep in the weirdest positions. We are very happy we decided to volunteer to host the pilgrims. Initially we were concerned. "Would they be OK? Would they find it too chaotic here with the children? Do they speak English?" and so on. But we decided to just leave it in God's hands. Do you know why our pilgrims stayed in the Wollongong Diocese? Because the name sounded funny. Through such whims, God works his magic. One of the things A wanted to experience in Australia was driving on the correct side of the road - the Left side. So I was happy to oblige. On some of our quiet streets he had a test drive. At one point we did a 3 point turn and A instinctively returned to the right (incorrect) side of the road. "Oops." replied A and quickly changed lanes. Sometimes the pilgrims just wanted to do simple things. 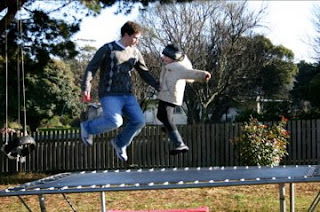 Here is pilgrim C enjoying the trampoline with Peter. You can tell by Peter's clothes that the weather was pretty cold. The week the pilgrims stayed with us was the coldest we have had all year. But this week has cleared up nicely and Sydney's weather is quite pleasant. Still, I wouldn't want to be camping outside overnight! There is a chance we will be getting tickets to the actual WYD Mass on Sunday. This is pretty exciting news and we are making plans for a very long day. We are praying that it all works out with the simple prayer, "God, if you want us to go, you sort it out." Cardinal Pell recently gave a press conference extolling Australians to have more children for all the benefits. However, I think he needs to get his bureaucracy in line as they still think a family is 2 adults and 2 children. Even the form Homestay families filled out only had room for eight people in a house. The Knights of Columbus, JPII Institute, and the Sisters of Life are hosting the Love and Life Site at Notre Dame University Broadway, Sydney, Australia. It is a very interesting insight to how a group of religious sisters are experiencing Sydney during the days leading up to World Youth Day. This photo is from their site showing the sisters trying out Vegemite. We are enjoying reading their insights and encounters with bemused Sydney-siders who have never or rarely seen any people in religious habits, or pilgrims full of excitement at joy at being here for "boring" religious stuff. It is really weird. We have only known the pilgrims for a few days yet it seems as if we have welcomed long lost friends we never knew we had. This wasn't just a subjective feeling. One of our friends from the village joined us for dinner on Thursday night - the second night the pilgrims stayed wth us. When Lana dropped him off home he asked, "Did you know these guys before they came here?" "No," Lana replied, "We only picked them up yesterday." "Oh. It seemed like you have known them for a long time." So in the morning Lana and the children will see them off from the parish church while I go back to work. They will be joining the many 1000's of pilgrims in Sydney for the week of activities and catechesis preparing for the WYD Mass on Sunday. We have exchanged addresses and contact details and hope that we will get to meet them again. Yesterday the Diocese of Wollongong hosted an "Everything Aussie" day to welcome all the pilgrims that have stayed in the diocese in preparation for next week's activities for World Youth Day. We travelled to the event in Wollongong via Macquarie Pass - a very winding path through the mountains, with many hairpin bends and road edges bordering on long drops to the ground. This is an interesting YouTube video of a motorbike enjoying the seemingly never ending bends. We were sufficiently supplied with a variety of buckets if anyone started feeling car sick. After this rather "scenic" drive, we wondered where we could park. The road next to the park was closed, so I went up to the fellows directing (and blocking) traffic and said we had pilgrims that needed to be dropped off. "OK, but you must continue on." "No worries," we replied. We then stopped at a point we could drop everyone off while I continued looking for a spot when Lana saw a number of empty spots just nearby. "Why not park there?" she asked. I looked around, thought, "Why Not?" and entered in the exit and parked. Right between the beach and the park. Our pilgrims then had the tough choice - go to the park or THE BEACH! (It wasn't really that difficult - the beach was on the list of THINGS TO DO). The seagulls were very co-operative once they realised we had some food scraps to throw their way. They hovered just above us while we were taking photos. Click on this photo of the greedy birds for a full detail shot. All of the pilgrims visiting our parish fulfilled their task: A foot in the both sides of the Pacific - the American edge and the Australian edge. 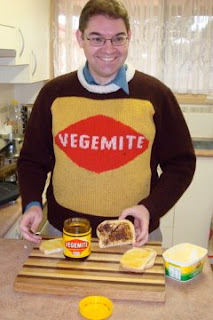 I was once more wearing my Vegemite jumper. This jumper had been made for Lana's sister quite a long time ago and she was generous enough to give it to us when she realised I was brave (or silly) enough to wear it more often. Quite a number of pilgrims stopped me and said, "Mr Vegemite! Can we take a picture? Can we get in a picture with you?" "Sure," I answered as Lana and Ariel scurried away to temporarily deny knowledge of me. (Actually Lana claims she was moved out of the way as "persons of no consequence" not having obvious Vegemite flavoured clothing.) I dutifully asked if they had tried Vegemite and gave them tips on how to enjoy it more. The "Everything Aussie" day was very busy with a small petting zoo, a Koala for petting, a kangaroo with joey, sheep shearing, rides, local foods and lots of other attractions. And Free Fairy Floss! Just right to get the children hyped up ready for Vigil Mass. Our feet were very sore by day's end. I seriously hope you dont mind me emailing you out of the blue. I came across your blog by chance earlier and it struck a cord, making me laugh as well as seeing the similarities! 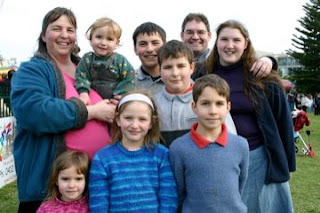 We are also a home ed family living in the South East of England and have 2 nearly 3 kids. I guess I just wanted to say hello and that your blog brightened a day that has been a bit of of wash-up so thankyou!! Do we mind? Not at all. The comments we receive and emails are a great encouragement to sharing our history on the Internet. We have dual reasons for maintaining Bruggietales. The first to to have a history of our family life as we grow and develop. This is like our online journal so we can remind our grandchildren of what their parents and grandparents were like (such as incidents like this). The other reason is to share the enjoyment that a large homeschooling family can have as they grow in knowledge of each other and have so many shared experiences. So thank you to all our readers for enriching Bruggietales with your comments and questions. We appreciate all of your interest and virtual friendship. That's Mr Vegemite to you! All Australians hosting guests must demonstrate Australia's culinary delights. At breakfast time this involves Vegemite on hot buttered toast. It is very important not to let them spread Vegemite themselves. The tendency is to spread it on the thickness of peanut butter. This is a big mistake! Lana has described the correct amount as Vegemite as "Scaring it on". A light scrape on hot buttered toast is great. Variants include Vegemite with sugar sprinkled lightly on top. Or the more adventurous may try Vegemite with Peanut Butter on top. This variation was invented by the boys. They seemed to enjoy this strange combination so I tried it too. It was quite tasty! Do not listen to friends with dangerous senses of humour. 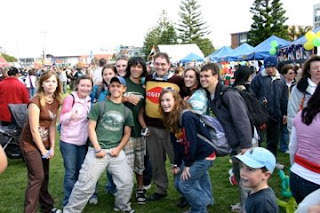 One of our Georgian friends - who shall remain anonymous - returned from Australia and presented an Australian session at the Homeschooling International Night. Her statement was "Australian's eat Vegemite like Peanut Butter!" This is true - as in we eat it as often as Peanut Butter, but not as thick. She then let the participants paste Vegemite on nice and thick and take a big bite. She then laughed at their discomfort. When we arrived and showed them how to eat Vegemite properly our new Georgian friend approached the local "Australian Expert" and complained bitterly. 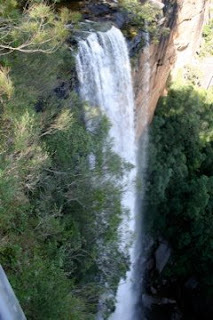 Today we went to Fitzroy Falls after Mass. Often we forget we are in the mountains as the land rises very gradually when travelling South from Sydney. Then it seems as if you turn a corner and there are these 80 metre high (260 feet) waterfalls! Cameras were going off all around us. The walk included little information signs about the various flora we passed to which the host families were able to add their own information. After the walk we had a sausage sizzle. This is where we cook a sausage on the grill, and put it on a buttered bun with tomato sauce (ketchup) and fried onions. These sausages actually contain meat (unlike hotdogs) and have flavour. As a treat we even supplied the yellow American mustard! We then had free time to have a look around. We were able to stop at a "Men's outfitters" store and showed the lads some authentic high quality Akubra hats. The lads look quite authentic in their Aussie hats so we practiced some "Gedday"s and "Mate"s. By the time they leave they may be more skillful in "Aussie-speak". One of the host families runs a private winery and was able to show us around the vineyard and wine press and demonstrate how the grapes were converted from the vine to wine to bottle. Finally we made it home to a fine meal and a small chocolate and lolly (candy) taste test. We'll provide more results of the test tomorrow. Our World Youth Day pilgrims have arrived to a very chilly winter's day. They left Kansas in 100F heat, arrived in Sydney to a reasonable weather and then came to the highlands to a chilly 48 and dropping. 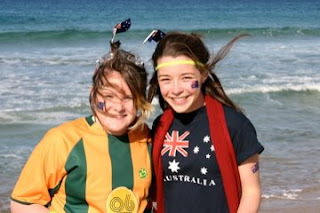 Naturally our duty is to show our visitors as much Australian culture as is possible in a short time. After the initial Gedday's and "How are ya"s we took a scenic route to the monastery for an opening Mass. 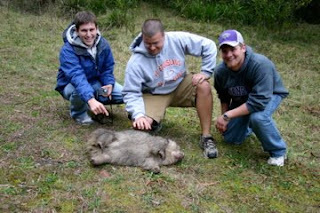 On the way we spotted a Wombat! Well, it may have been dead and technically roadkill - but it was Australian wildlife! So here are the three big game hunters posing behind their prize. Well, it wasn't technically their prize, but I'm sure their stories may well tell otherwise. Shortly afterwards we were travelling along the driveway of the Monastery and spotted the Catholic Kangaroos! Quick stop and our intrepid hunters attempted to adopt the style of Steve Irwin. They approached very very carefully so as not to frighten the kangaroos. If you click the photo you will see a larger detail picture. The Kangaroos are on the right, looking curiously at these strange people coming closer. Naturally, once the distance was too short, the kangaroos turned their backs and bounced away. Sometimes an active one year old is a little like a cyclone (hurricane). 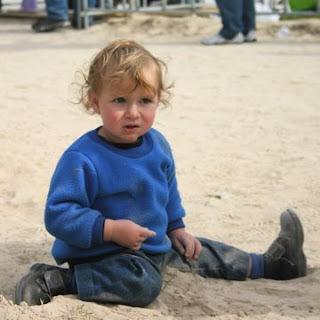 We always seem to be following a trail of destruction and displacement. Martin isn't so much destructive as very displacing. "The Relocator" is an appropriate title. 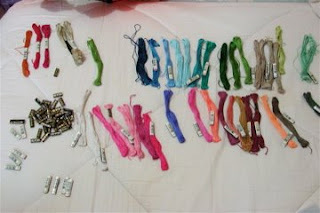 Lana stores her active DMC floss stash in a set of cheap plastic drawers. She cleverly placed these with the front handles facing the wall. Today Martin discovered that if you pushed in the drawer from the back you can reach a small hand in. A small hand about the size of Martin's. He carefully reached in and pulled out skeins of cotton, one at a time, and then carefully slid off the two little paper bands and put both cotton and band on the floor. And then he reached in and pulled out another one. These labels describe the colour and number of each skein, essential for completing a cross stitch. The children heard a cry from the bedroom a short while later, "Ohhh! Martin!" There was the pile of cottons and associated labels all randomised. Notice how so many colours are really similar? Luckily Lana has a sample of each colour in a special case in the cupboard. Lana, Ariel and Eric then spent half an hour sorting the 40 colours, matching the bands and then putting the bands back on the skeins. Now the plastic drawers are shoved against the wall and something heavy is shoved in behind them. It could have been worse. The bands weren't destroyed and the cotton skeins weren't unravelled - or trailed up the hall behind him as he showed his discovery. We are thankful for small mercies. Last night Lana and I were remembering our travels to and from the US. We figured it would be a good idea to give some travel tips for people travelling to Australia. 1. Remember Australia is a LONG way away. By the time you land in Sydney, Melbourne or Brisbane you will probably have been travelling about 24 hours. 2. Australia is on the other side of the world. Opposite Season and opposite time. 8am in Sydney today is 6pm Atlanta yesterday. Summer in the US is Winter in Australia. 3. Drink plenty of water. Avoid too much fizzy (pop/soda) and alcohol. This will avoid headaches from drying out. 4. Sleep however you can on the plane. I know that you will be excited, and uncomfortable in "cattle class" (economy), but try to get some power naps. 5. Pack sensibly. You probably won't use half the stuff you bring. 6. Australia has different power. We use 240v and different power sockets. Your equipment won't work without an adaptor, and an adaptor alone won't help if the item cannot handle the 240v. Most computers, iPods and other stuff have adaptors that handle both power levels - check your power brick and adaptor. 7. The mobile/cell phone network here is NOT the same as yours. If your mobile carrier allows International roaming, you will be slugged a heavy price. You are better off getting an International Phone card in Australia, or using the Internet. 8. There is hardly any Free Wireless Internet coverage in Australia, and it is not extensive.The public access at airports and McDonalds is expensive. There is quite a bit of "free public" wireless coverage from an abundance of unsecured wireless routers, but that isn't really the same thing. 9. 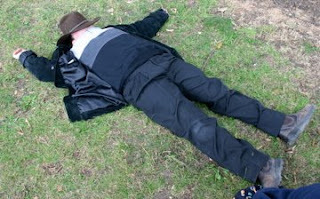 When you land in Australia early in the morning, DO NOT go to sleep until night time. This means another 12 hours up and awake, but it is the only way to minimise jet lag. If you sleep on arrival - during the day - you will probably be zonked out for the first 3 or 4 days of your trip as you adjust. 10. Be patient. There will be hundreds of thousands of people landing within a short space of time. Being self important and impatient will actually DECREASE your assistance from local people. A friendly request will get a great response. 11. Australians drive on the correct side of the road - the LEFT SIDE. So be sure to look BOTH ways before crossing the road. Your habit will be to look one way as you step off the curb. This will ensure that the car will hit you on your blind side. Anyone else have more tips? We are hosting some of the World Youth Day (WYD) Pilgrims as they participate in activities in our diocese prior to attending the WYD week. There is great excitement in the parish as everyone is getting ready to welcome our brothers and sisters in the Faith from around the world. The pilgrims staying in our parish are all from a group from central USA. Luckily we have a supply of warm clothing for while they are here. We may also need to make a trip to Vinnies Op Shop (Thrift Stores) to get a warm jacket or two.